Chris Ware’s graphic novels bring diagrams into strip cartoons. There is a sense that the terrible sadness and existential pain they tell of are in some ways created by the very lines of the diagrams that stretch beyond their protagonists’ control. If only they could contain their worlds within a simple sequence of cartoon panels, things might start to get better, but at any moment, halucinations may throw the sequence in strange directions, and then the page layout may fragment into contrapuntal ‘meanwhile’ sequences, or into stage sets or full blown expanses of diagram. Such moments are wonderful for the reader – they expand the form, create disjunctions and tensions that produce aesthetic experience arguably unavailable in other art forms. Phillip Pullman has described his admiration of the aesthetic of counterpoint within graphic novels, but in Chris Ware’s work, these moments are devastating for the characters, revealing only their helpless subjection to abstracting forces that parallel and undercut their lives. Counterpoint can only mean that bad things are going on elsewhere: two people who ought to be together, or that two parts of the same person, are split apart in parallel isolation. What are the diagrams, the counter forces, that disrupt an orderly, happy progression of panels? In many ways, the dominant diagrams are those of psychoanalysis. The frustrated obsessions of the characters carry the heavy weight of Freud’s topographical model, oppressed by super-egos, or struggling to repress the forces of the id, they are in terrible relation with their objects (lost or otherwise). The vectors are the lines of history, of genealogy, of desire, of separation. Does Ware indicate a set of sociological diagrams beyond the limited speher of the psyche and the family? Do the diagrams show an awareness of the historical forces beyond the narrative? In a sense it is meaningless to ask these questions, separating the one from the other. The introduction of the psychoanalytic register into the comic itself reveals a historical development. The traditional coherence of the comic book character, their external objectivity, gives way to reveal vicissitudes of subjectivity that conventionally belong in literature not in an easy art form aimed mainly at humour or kids. Certain optimistic assumptions are given up in the process. In fact, at the start of Jimmy Corrigan, Ware even ironises the optimistic language of modernist ‘visual communication systems’ such as Isotype. But we can discern a sense of the broader culture and society and its influence on Ware’s characters. The characters’ self-aggrandising strategies for healing their narcissism are based on emulating media images. Jimmy Corrigan’s relationship with his adopted step-sister is situated within the wider context of American racism and is drawn back (in the back jacket shown above) to the history of slavery. But there are two significant differences – the first is that the macro scale of events does not in general comes across as historical – there are no current momentous events taking place in the background, and the outside is felt as a strange vague pressure on the personal and community milieu. This leads to the second sense, which is that the protagonists within Ware’s novels are fundamentally constrained in their lives, separated away from each other even within their aching attempts to reach out to each other, and so the entire sense of their relation to the wider social is that of a complete withdrawal, or that the background forces of the diagram are the very things that hamper, constrain and cow them. Is this a portrait of contemporary society or of ahistorical character types? Comics have after all often featured weedy characters. Jimmy Corrigan, Rusty Brown, are in many ways timid like Caspar Milquetoast, who first appeared in 1924, and their dependence on grandiose fantasies of becoming superheroes is a classic trope of the Fordist period, where the wimpy guy turns into Superman. And beyond cartoons, one might reach for comparisons with fantasists such as Walter Mitty, written in the 1940s. Is it not possible that they are a in a simple continuity with these characters? Perhaps to a degree, but I would argue that there are differences with some of these characters. The average guys of the superhero comics do actually become superheros, Jimmy Corrigan and Rusty Brown don’t. Milquetoast and Mitty may be wimpish fantasists, but they at least have wives. All of Mitty’s fantasies are wish-fulfilling day dreams to do with formal, often uniformed roles that involve the heroic deeds of war and archetypal male power (a navy pilot, a surgeon, a courtroom drama, a world war 2 flying ace, a firing squad). Ware’s characters on the other hand are more trapped within themselves, more subject to halucinations that and more like terrible experiences of fragmentation, depersonalisation, and schizoid states. Corrigan’s fantasies about Superheroes are less current fantasies about omnipotence than relivings of a terrible link to a kind of primal scene, where as a child (the smartest kid in the universe) he had, quite normally, identified with a superhero, who, when Jimmy had gone to see him at a book launch, had ended up having a one night stand with Jimmy’s divorced mother. Early the following morning, the man who plays the superhero leaves Jimmy his mask as he sneaks out of the house, so that then wearing the mask, the young Jimmy diligently passes on to his dressing gown clad mother the man’s parting words “I had a really good time”. Thus the fantasy of being the super hero is already inscribed within an image of oedipal exclusion of parental sexual relations and of a superman father surrogate within the context of a broken marriage. What brings about this level of angst to the comic? One maybe to do with the site of the comic as a form most associated with male adolescence, the time when self-definition is most in question. The issue of self-construction within post-Fordist society is arguably more fraught, and goes on for longer in people’s lives today. Think of the whole critiqe of the inability of contemporary men to grow up. In a society where roles were more prescribed by economic and social position and by a more formal set of cultural norms, there was less requirement to know oneself, you could simply hide within the required role. In many ways, the stasis of Ware’s characters is more akin to the situation of Goncharev’s Oblomov, written in 1859, an aristocrat whose freedom is such that he is immobile and unable to summon the energy to act. Of particular significance is the role of the characters’ own narcissism, their own frustrated and utterly unrealistic ego ideals, boosted by the ever increasing contemporary belief that one can be whatever one wants to be. This emphasis on the individual’s freedom is an aspect of the sense of contemporary society as anomic, lonely, lost. Robert Putnam’s Bowling Alone is the kind of sociology that Ware’s work brings to life (though an almost death in life), but so too is that of Richard Sennet, and his portrayal of a bakery where, in the past the work had been hard but had afforded the workers some satisfaction and cameraderie and identification with the task, in the contemporary bakery, the workers press buttons on a computerised system they don’t understand, and have no identification with their work because they see themselves as only working there temporarily while they pursue their self-chosen trajectories towards being actors or other creative individuals. As well as the New Yorker cover shown here, Ware has made other works that explicitly compare the contemporary situation with that of the mid twentieth century. His poster for a Danish comic fair asks the question “why was it that in the past cartoonists depicted adults in children’s roles?” showing them playing at super heroes, and today “depict children in adults roles?” showing children on a child psychoanalyst’s couch. 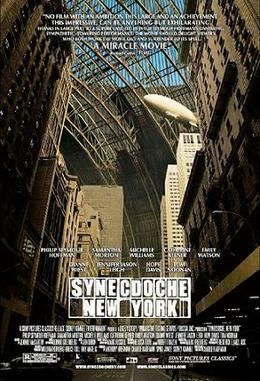 Synechdoche New York poster showing the vast stage set of Caden’s life, including here a zeppelin flying above the buildings. The painful relation between modesty and the vast world of desire beyond is a common subject in Charlie Kaufman and in particular his film Synechdoche New York, which seems almost a transposal of Ware’s sensibility and form to the screen, in that it features a constrained central figure, an intermixing of fantasy and reality, and a strange dissociated vision of the world beyond. Kaufman’s film shows a theatre director, Caden Cotard, who, utterly crushed by his shyness, unable to live the life of glib transgressive sexual liberation of his ex wife, beset by the failings of his body and desire, ends up staging a huge drama of his entire life, complete with recreated buildings and street scenes and a cast of thousands, in an impossible of act of trying to connect with his own existence, while becoming caught in ever more involuted knots of self-reference and derealisation. We might say this is Cotard’s attempt at creating a Lukacsian ‘ totality of objects’, but this would mean creating a novel rather than a drama. In fact the question of Cotard’s tragedy is involuted – for while it may seem to be the ultimate act of hubris to attempt to recreate a full scale simulation of one’s life, there is a sense that Cotard is in fact doing so only as a desperate strategy to deal with his life falling apart. The story is not that of his own will acting against the world and coming to its own downfall as a result, but rather trying to create a world in which he might be able to act. Kaufman makes use of the same formal self-references of his medium as Ware, staging a film within the film in the way Ware stages comics within the comics, enabling the edges of reality to be revealed through the edges of the form, expanding the diegetic frame to take in representations of the whole of reality. In Ware’s case this means drawing attention to the outer edge of the form – the lines of the cartoon panel, the outlines of bodies, the engineering lines of the blue print, maps. Ware’s simplicity seems to bring that outer edge into the interior of the characters, embodying his characters’ modesty in a manner that may itself be repressive, though one can’t help also feeling grateful for its safety, harbouring the characters from lurid pourings out all their angst, as perhaps a Charles Burns would. Synechdoche New York’s filmic sensibility is a little more Burnsian – sweatier, sparkier. Perhaps we can say that Kaufman sits half way between Ware and the other great contemporary novelist of the contemporary crisis of Male desire, Houellebecq. Bruno, the main character in his novel Atomised is similarly sad, similarly contorted, though darker, angrier, more vindictive. Houellebecq’s novel is explicitly historical, pointing to a kind of eccentric social critique of the post-social democratic world, somewhat in the mode of Adam Curtis, and equally wracked with the some tension to between explicitly moralising while formally finding it impossible to join in the delightful corruptions. In Ware, Kaufman and Houellebecq, we might say they deal with their failure to live up to the ideal of the fully liberated, expressive individual – they are confused by the twist in the moral injunction of the time. As Zizek would say, they are oppressed by their failure to enact the Lacanian superego’s injunction to “Enjoy!” Perhaps for Ware’s characters, those lines are the Deleuzian lines of flight the characters are simply not able to take.